Cool find of the day: Open Sound New Orleans. 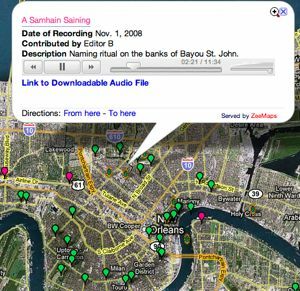 Calling itself “a collaborative soundmap of the city,” the site invites New Orleanians to share the recorded sounds of their lives. Recording equipment is loaned to community organizations, neighborhood groups, and individuals to facilitate a wide range of “dispatches” from around the city. Sounds are archived and organized geographically on a soundmap of the city (pictured, right). Pins on the Google map of New Orleans are color-coded to designate whether they are music, conversation/interviews (or prayers), ambient noise (footsteps on a street, frogs and crickets in the trees), recently added recordings, or currently featured sounds. Clicking on a map pin will open a window to the recording, with options to stream or download the sound. Users can also search the library of recordings from a list, sorted by categories. You can also get directions to each of the sounds’ locations through the mapping program. I didn’t mean to, but got completely sucked into trying out one curiously-named sound bite after another. The sound library is fascinating and the entries are diverse. Not a podcast per se (there is no RSS feed to automatically receive new additions to the collection), this is a thought-provoking use of digital media (like audio recordings) mixed with free technology (like Google Maps), to make creative and useful new mashups. If you happen to be involved in any creative endeavors that mix up different media and technologies to yield a whole new product, let us know.